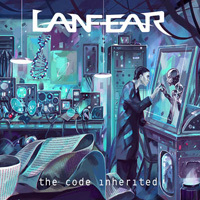 True to form and consistency, four years have passed and Lanfear launches another new album, the latest and eighth album, The Code Inherited, still on Germany's Pure Legend Records. 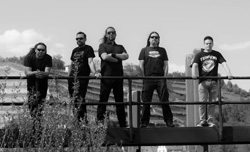 Once more Lanfear delivers their progressive power metal. Now, I must admit, I was a bit put off at the start with The Delusionist, a rather harsh sounding song with vocalist Nuno Miguel de Barros Fernandes taking a shot at adding dirty/death vocals. (He get a little raw in the latter half of Converging Saints.) 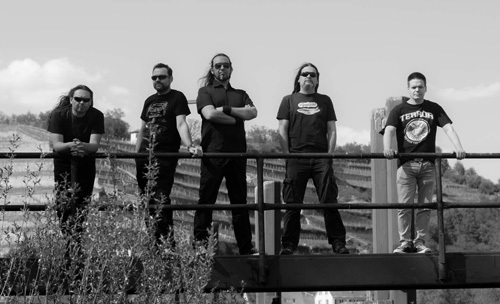 But we recover with the following The Opaque Hourglass and Evidence Based Ignorance, both returning to the foundation of melodic metal and superb vocal harmonies. Those songs and also Converging Saints display Lanfear's trademark sharp and brisk riffage, adding accent to the sometimes galloping rhythm section. Of course, guitarist Markus Ullrich offers an abundance blistering leads throughout, another Lanfear highlight. These things also define the title track, the longest song here. It has interesting start with lighter guitar lilting over a significant bass line. But then, around 1:15, there's undecipherable voice chanting some electronic mantra. Because you can't understand it, it becomes annoying. Something more subdued, at least in the first half, comes with Remain Undone, where the vocals and vocal harmonies ride over dialed back riffage. At the midpoint this leads to another strong bass line presentation with more of Ullrich's fusion like guitar work. For something nearly completely different than the rest, there's the concluding Summer Of '89. It's pretty much a melodic hard rock song lead by the guitar line, yet loaded with groove, melody, and a catchy refrain. It seems Lanfear hooked up with their AOR musical muse. All in all, with The Code Inherited, Lanfear doesn't disappoint. Rather, and better, the stay true to their progressive power metal calling. If you're a fan, you'll want to get this album.